Located downtown on Main Street, right in the center of our hotel district! 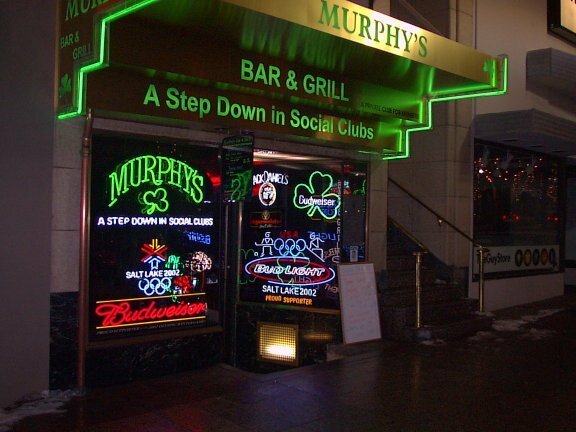 Murphy's is located within "crawling distance" from all our downtown hotels! About Murphy's... Because it is amongst the hotels, concierges send plently of newcomers to the bar and they mix with the regular clientele to create a fun atmosphere. The place gets full but not jam-packed every weekend. TV's for sports viewing, a game area, a jukebox with a nice selection for the 21 to 50 year old crowd plus selections from Frank Sinatra to the Pogues. Murphy's atmosphere is the kind of place where locals greet new arrivals and everyone appears to know each others' name. The kind of crowd that would buy a round, and asks about the kids and the wife. Murphy's customers are a broad range of ages and professions... gathered informally, as if in a friend's living room. Murphy's has been called a cozy pub..[with its] soft wood and lighting are a favorite with... the Downtown neighborhood and its many Salt Lake visitors. What to Order... Murphy's has a full menu for lunch or dinner with appetizers and daily specials, in addition to salads, sandwiches and burgers. Besides a wide variety of wines, liquors and spirits, there is a large selection of draft and bottled beers, consisting of dark ales, sparkling lagers and rich stouts, including, of course, guinness. It's an Irish pub, so belly up to the bar and order a beer or a traditional Irish coffee. Just a short walk from all downtown hotels, Murphy's is a must. Visiting Salt Lake City? Get Great Salt Lake City Information Here!